We all want that Hollywood smile with big, white and shiny teeth. But most of us live in the real world filled with teeth staining necessities like coffee, tea, soda and maybe an occasional glass of merlot. So what do we normal folks do to get that Hollywood smile? Having a beautiful smile may be even easier than you think. 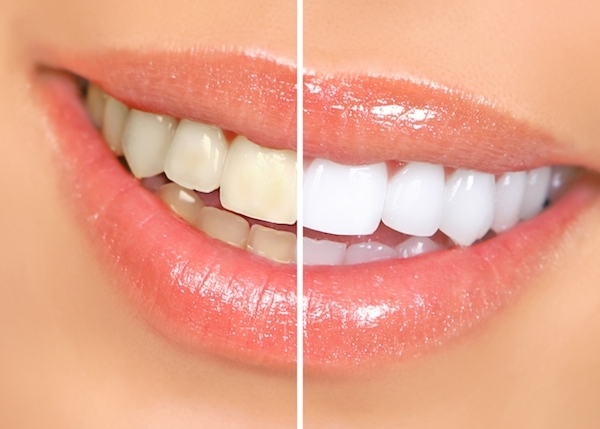 Many people achieve the look they’ve been dreaming of with our simple, painless whitening procedure. How does teeth whitening work?To understand how teeth whitening works, one has to understand how teeth become discolored. There are two types of discoloration: extrinsic and intrinsic. Your normal teeth brushing with whitening toothpaste will help remove the daily extrinsic stains (think surface staining) left from coffee, tea and red wine. Intrinsic (below the enamel) staining is caused by years of exposure to these staining substances and is harder to change. Teeth whitening will unfortunately not work on any teeth with dental bonding or crowns, make sure to check with us before moving forward. So how do teeth whitening agents get the stains out from “inside” your tooth? Most whitening gels (or sometimes called bleaching agents) contain an oxidizing agent in the form of carbamide peroxide or hydrogen peroxide. These ingredients are the active ingredient in most whitening agents. The gel reacts with the internal aspect of your tooth, mixes with the discolored areas, and breaks them apart making them appear whiter! REMINERALIZING AND ENAMEL BOOSTING GELSAfter whitening your teeth, you’ll want to protect them and maintain them, right? We’ve specially formulated remineralizing and enamel-boosting gels to strengthen your teeth, protect against new stains, and improve your overall oral health. Our in office formula seals the pores of your teeth to lock out stains and alleviate sensitivity after you whiten your teeth with our L.E.D. Whitening Kit. CARBAMIDE VS HYDROGENHydrogen peroxide and carbamide peroxide are the two most commonly used chemicals for whitening teeth. They both work to lift stains and lighten the shade of your teeth, but is one better than the other? Most people go 4 to 6 shades whiter in one session, one session is 20 minutes, you can however do 3 20 minute sessions back tgo back. Since this solution is kosher approved, and contains no harsh chemicals, you won’t experience any sensitivity!